The Mediatrix 2102 VoIP device is a pretty slick little box. It can sit between your upstream internet connection (such as your cable modem or DSL modem), and your downstream devices (such as your computer, or a router), and transparently provide VoIP capabilities. Because it sits in front of your router or computer, VoIP bandwidth can be extracted from your upstream connection in advance, leaving what remains for your standard data connection (computer, router, LAN, etc) downstream. You can plug in up to two telephony devices, allowing you to keep your options open, and make good use of your existing internet connection for multiple VoIP connections. I managed to pick up several of these boxes recently, and before deploying them, decided to do some administrative tasks to bring them up to date and configure them the way I would like. The firmware version installed on the units I received was several versions out of date. The web-based configuration menus had a very rudimentary appearance, and many of the configuration options discussed in the current documentation (available on the Mediatrix website) were not found in the menus. It also sounds like there have been tons of fixes and upgrades made by the manufacturer since the version on my boxes was installed, so an update sounded worthwhile. In addition, the default settings allowing configuration of these devices is best suited for a trusted corporate environment. From the factory, the unit allows web-browser-based access from the device's LAN port for simpler settings (choice of networking types, etc), and allows web-browser-based access from the device's WAN port for more advanced settings (SIP settings, telephony options, etc). This sounds ideal for a corporate environment where the devices may sit at someone's desk in a trusted environment, allowing the administrator to remotely configure and update the SIP settings from the WAN port (upstream) side of the unit. However, for SOHO usage where these boxes will be deployed and left to run unattended by non-technical users (aka set it and forget it), it would make life easier to have both of the administrative browser-based menus available from the LAN-port side of the device. This also will make the unit more secure, since the device comes factory configured with a generic 'root' account with a well-known password available to anyone willing to do some research. Allowing WAN access to unsecured default accounts on a device like this is just asking for trouble. You could simply change this WAN-accessible root password (I strongly recommend you do this anyways), but I would prefer to have the root access containing the more advanced administrative settings primarily available from the LAN-port side of the fence without exposing access to the device to the web. (This has the added bonus of allowing both administrative browser-based menus to be accessible from the LAN-port client computers when administrative tasks are needed, meaning you don't have to move cables around just to access admin menus). Security considerations such as these are important because these devices can comfortably sit IN FRONT of the firewall / router device on home networks, transparently passing unused VoIP bandwidth onward to your LAN. Many recent SOHO routers and network devices allow uploading new firmware version from inside their web-browser-based control panels. This device doesn't have that feature, but it does allow more complicated and flexible methods for updating firmware, such as downloading new versions from a TFTP or HTTP server on your network. You can configure the device to check for new firmware at that location on a regular schedule if you wish. These are enterprise-level features which may seem more difficult than cheaper consumer boxes, but give sysadmins more options in the end. The Mediatrix 2102 units I had came with firmware version v5.0r3.29. The manufacturer's website indicates that the current version available for download (in their support portal under the "2102 SIP v5.0 General Availability" section) is v5.0r15.92. There is a huge difference between these versions, both in the number of features available, the layout of the menus, and also the number of fixes made and upgrades in place. If you've already read this far into this article, it is worth doing this upgrade. In my experience, the simplest way to get new firmware onto the device is to set up a TFTP server a computer on your LAN, and then direct the Mediatrix unit to download the firmware being served from that computer. The experience described below will follow that path. First, the device seems to be happiest (and easiest to configure) when it has been allocated an IP address and set up on the network. Giving it a fixed IP address will also make it easier to connect to later on from other computers in order to test access to the administrator menus. I happen to have a DHCP server on my LAN here, so I configured it to provide a single fixed IP address to the Mediatrix device (based on its MAC address) whenever it makes a DHCP request. When the TFTP server program is set up (which takes all of thirty seconds), you simply grab the current firmware from Mediatrix's website. You unzip the archive they provide, and place the files in the root folder used by the TFTP server software. When the Mediatrix unit goes to your TFTP server to find firmware upgrades, it checks for a file called Setup.inf to guide the firmware upgrade process, so it is important that file is sitting in the root of the TFTP server when accessed (along with the other accompanying files that make up this upgrade). Now that the stage is set to perform an upgrade on your Mediatrix device, you should also download some software from the Mediatrix website to assist in controlling the unit and configuring the settings. They provide a tool in their support section called the "Unit Manager Network", or UMN. This tool can be used for free to manage up to three Mediatrix devices simultaneously without purchasing a license key, so it is fine for our efforts here. The current version available for download from the Mediatrix support portal is v3.2r23.50. The UMN software needs to be installed on a Windows machine on your LAN. Make absolutely sure you reboot that Windows computer after the installation process is completed, because the UMN package won't work properly until you do. With a DHCP server configured to provide a fixed IP address to the MAC address of the Mediatrix box, you are ready to go. Plug it into your LAN, and power it up. It will grab the IP address from your DHCP server, and the leftmost light on the Mediatrix box will be solid green (not flashing). On the Windows computer with the UMN software installed, start the "Unit Manager Network" program from your Start Menu. When you see the "Connect to Unit Manager" prompt window, you don't need to provide a username or password; just click OK when starting the program. Back in the main UMN window, the MAC address of your Mediatrix device will now be shown. You should right-click it and choose Refresh a few times to ensure it shows up completely along with submenus. Click the plus-sign to the left of the MAC address to expand the tree of options beneath it. Right-click on "Software Download" from the list of options shown for the device, and choose Edit. When the options are shown in the right pane for Software Download, uncheck the box for "Use DHCP", and instead provide the location of your TFTP server in the Primary and Secondary boxes. Click OK at the bottom to enforce these changes. Then, assuming your TFTP server containing the firmware upgrade is running on the LAN at the location you specified, right-click on the MAC address of your Mediatrix unit back in the left pane of the UMN window. Choose "Action", then choose "Download Software (Graceful)". The unit will proceed for a few minutes to upgrade itself. During this time, the four lights on the unit will flash in a sequential pattern. The upgrade will take twenty or thirty seconds to complete. You will know it is finished when the lights go back to the normal, static pattern (right-most light lit solid green). At this point, I would suggest going back in to the Software Download settings for the device and setting them back to how you originally found them. 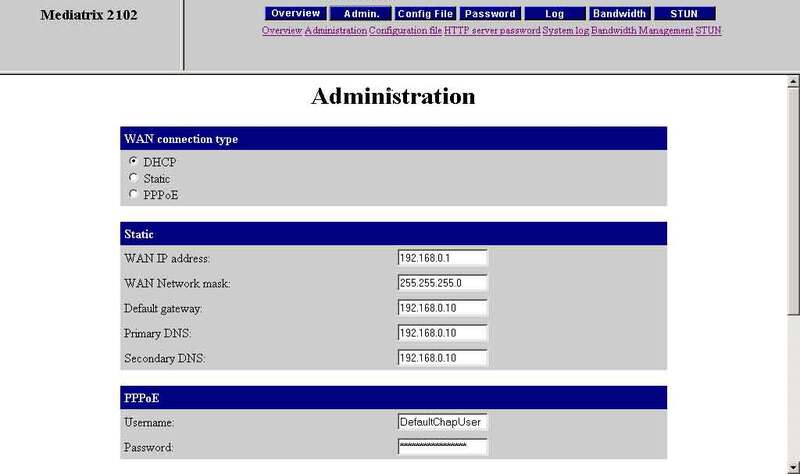 You can also set many options not found in the browser-based menus by communicating with the device over SNMP. We will want to enable access to the root account of the browser-based menus from the LAN port of the device. In the UMN main window, right-click the MAC address of your Mediatrix device in the left pane of the window, and choose "Edit SNMP". 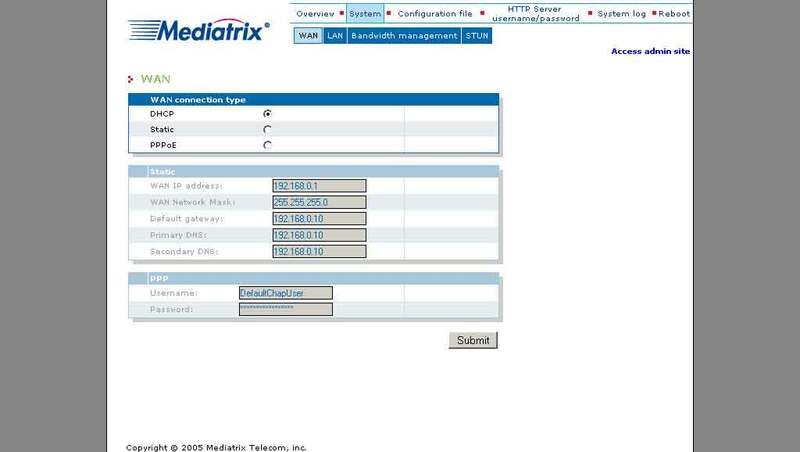 In the tree-view of SNMP nodes that appears, expand "mediatrix", then "mediatrixProducts", then "mediatrixConfig", then "httpServerMIB", then "httpServerMIBObjects". Beneath "httpServerMIBObjects", you should see a list of leaf nodes (shown with stylish leaf icons next to them). The leaf node we are interested in is "httpServerAdminAccess". Right-click on that node in the left pane, and choose "Get". This will bring the options for it onscreen in the top-right pane. The default value is "wanOnly", which will appear in the top-right pane, so click on it several times until the dropdown appears allowing you to change it. Change the value to "lanOnly". This will allow root access to the browser-based menus from the LAN port on the device. Be sure to then right-click on the "httpServerAdminAccess" leaf node again, and this time choose "Set". It will then save the setting back to the device. You are now done in here, unless there are other settings you with to adjust. Mediatrix provides a large document detailing the various options and meanings for the MIBs shown in there. You can now test connecting a computer to the Mediatrix device on the LAN port. Configure the computer for DHCP, and it should configure itself transparently as being your outside connection (as though the Mediatrix device wasn't there in the middle). The root account and the admin account contain different sets of options. Both sets of options will likely be needed to fully configure your SIP accounts and also miscellaneous network settings on the device to your liking.